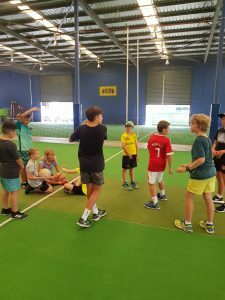 Indoor Sportz Strathpine School Holiday program is a unique and specially designed program that provides quality care to primary school aged children. 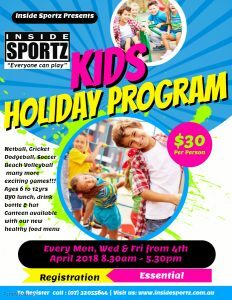 Our holiday program is held at inside Sportz Strathpine over four generous sized courts as well as our lounge area with a large flat screen TV, fully equipped kitchen, tables and chairs. Inside Sportz provides a safe, encouraging and supportive environment for your child/ren. Our holiday program offers services throughout the Queensland School Holidays every Monday, Wednesday and Fridays 8am – 5.30pm.